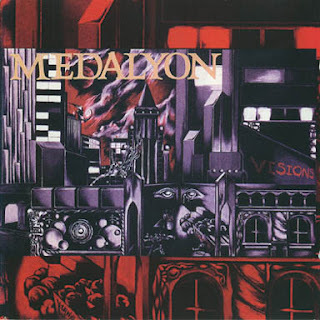 Δελτίο τύπου: «Medalyon from Cleveland, Ohio started under this name early 1987 and offered killer US Heavy/Power metal with awesome instrumental facility and power vocals. From 1987 until 1992 Medalyon recorded lots of demos and unreleased stuff. At 1995 and 1999 were released two stunning albums and of course Arkeyn Steel Records has managed to track down this magnificent band. Our main goal was to release two separate CDs representing Medalyon albums plus many bonus stuff from demos and unreleased recordings. YES! We finally made it. The first one is called "Visions" and it will feature the 1995 album plus the band's super rare Demo 1988 (5 songs) and single tape 1992 “Never Goodbye / Master of Your Mind” (2 songs). More than 74’ minutes of pure US METAL waiting for you! Everything is re-mastered direct from DAT tapes packed with lyrics, bio and fantastic vintage photos. Additionally, we use the original “Visions” cover because it was a new vision of metal covers back in the days. The second release will be announced next months!